What Should I Get for the Kids? Parents often ask this question when Christmas is facing them. As we go into Christmas 2000, we see that the hottest toy is Sony's Playstation 2, and that there are huge lines and even fights over places when lining up to purchase this toy at stores in the United States. When my kids were young, my then wife and I ask this question, not from the standpoint that our kids had every conceivable toy, but from the standpoint of "What toys should we get our kids, so that they would truly benefit from having these toys?" If you are facing such a dilemma now, whether buying toys for your own children or other's children, read on about what toys these families got for their kids. In 1876, the mother of Frank Lloyd Wright, possibly the most famous architect ever, bought for Frank a set of wooden blocks which were designed by Friedrich W. A. Froebel, a German who created the concept of kindergarten. These blocks were part of a set of toys and gifts intended to inspire young minds to be imaginative. 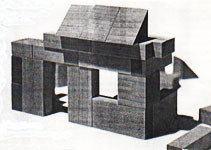 These blocks were simple pieces of different shapes and sizes of wood, such as shown in the picture below. There are cubes ( a perfect square block) and other blocks in the shape of rectangles and triangles, and putting them together form other shapes. Spatial relationships and proportional concepts get formed through play without the child realizing it. At the age of 88, Wright said, "What a toy that was. I became susceptible to constructive pattern evolving in everything I saw. I learned to "see" this way, and when I did, I did not care to draw casual incidentals of Nature. I wanted to design. The maple wood blocks are in my fingers to this day." Several years ago, there was, at the Massachusetts Institute of Technology, Cambridge, Massachusetts, USA, one of the world's leading science and technical universities, a senior year student who was the top student in mathematics. For her entire life up until then, she had received only the grade of A in every subject that she had ever taken, except once in primary school first grade when she received the grade of B, in penmanship. When she was a child, her mother gave her a set of coloured plastic magnets of alphabet letters and numbers, which a child could stick to the refrigerator or any other metal surface. She memorized the colours of each letter and number, and she says, to this day, whenever she sees a word or number, she sees that word or number in her mind represented by the colours of the magnets. She also remembers, when as a child of 12 in Germany, in geometry class having to draw every diagram with a ruler and every circle with a compass. Around that time, her father told her that "the square root of two is irrational." Other times she thinks about the number zero, her favourite number. She says, "Zero is special; it's the most basic of numbers, the beginning of abstraction, and abstraction is what math is really about." So this year when confronted with the question first raised above, give some thought to getting something other than just the latest video game or playstation or caricature doll or pokemon for your child. It may be difficult to find things such as Froebel blocks, magnetic numbers, a slide rule, or other similar item. Ten years from on, will the child say as much about the latest video game of today? (Note: These stories were read several years ago from two publications, "May/June 1996 issue of This Old House" about the Froebel blocks, and from an issue of "MIT Spectrum, date unknown" about the magnets.